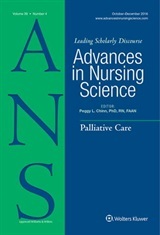 Professionally both authors promote the importance of early and frequent communication with patients and families about their wishes or healthcare goals. Our personal lives have enriched and informed our passion. We’ll take this opportunity to give you a brief snapshot of two contrasting personal experiences. It is our hope that these experiences will inspire you to read our article on end-of-life communication. We will begin with Mary Isaacson’s personal account of an experience, where she tells of the challenges of honoring the patient’s wishes, while at the same time preparing the family. We conclude with Mary Minton’s personal story of being with her father and siblings during their father’s final weeks. committed to trying another round of chemotherapy. On the other side, Aunt Donna remained fearful of their future. She could see, along with her grandson and his wife, the physical deterioration of Uncle Don and asked for guidance as to what to do. I prepped them in the questions (e.g., prognosis, likelihood of remission with the chemotherapy, quality of life, palliative care consult) to ask the oncologist at their next visit. When we returned home to South Dakota, I left with a heavy heart knowing that I wasn’t able to help them speak to one another. However, I was somewhat comforted knowing that I had prepared Aunt Donna and her grandson in what to do when Uncle Don’s condition deteriorated. Two days later, Uncle Don was too weak to get out of bed. They transported him via ambulance to the hospital, where among the plethora of diagnostic tests and consults with specialists, his grandson successfully advocated for and they received a palliative care consult. His condition was stabilized enough for him to return home and with the help of hospice, he peacefully died 5 days later, in his home surrounded by his family. This story, while difficult, portrays the importance of honoring the patient’s wishes, while also being realistic about the disease trajectory. Even though Uncle Don wasn’t ready to accept that cure was no longer possible, Aunt Donna was. Thus, my communication varied between the two. For Uncle Don, I provided a listening ear for him to share his legacy; for Aunt Donna and her grandson, we developed a plan to help them prepare for his death. lived sparsely. In their retirement years, Mom and Dad continually downsized. Following Mom’s death, my Dad kept this rhythm, sometimes to our chagrin when we still wanted something of Mom’s. However, his German preference for orderliness was such that my sister and I needed only a couple days for discarding or distributing my father’s belongings following his death. My siblings and I supported our parent’s end of life wishes, as did their long time family practice doctor. My mother died of a chronic respiratory condition at the age of 87. When I arrived for a weekend visit after not seeing her for nearly 6 months, I immediately sensed her struggle to stay alert. Her breathing was quite labored, yet she greeted me at their apartment door with her trademark smile and open arms. As she and Dad watched TV that evening, I rubbed her feet and clipped her toenails (the home health nurse in me!). She was coherent but her breathing was labored and she was flailing her arms occasionally. I queried Dad about this behavior—was this her norm lately, I asked? He calmly replied yes. He was her abiding caregiver and though we didn’t talk about her dying process, we both knew what was happening. A peaceful gratitude for simply being together prevailed. The next morning Mom died in bed with Dad beside her. As her parting gift, she had waited for me to come home. his will were updated and accurate. I followed Dad’s health care needs during the next four years and my sister handled the financial details. Our brother offered moral support. At the age of 92. Dad’s health declined following a hip fracture. In the final six months of his life he transitioned from independent living to assisted living to skilled care. In that journey his cognitive ability declined and culminated in a hospitalization for delirium. His family doctor advised a palliative care consult and I remain forever grateful to the compassionate and skilled palliative care physician who guided the final steps of my Dad’s life which included a 2 week stay in hospice. I have poignantly beautiful memories of the nurses (who firmly but kindly encouraged me to be the daughter rather than the nurse), the social worker who acknowledged feelings I could not yet name, the music therapists who touched Dad’s soul with cherished hymns, the therapy dog, and pastoral care. As both a recipient and observer of Dad’s skillfully orchestrated care, I had been given a ringside seat to experiencing the best of advance care planning, palliative and end-of-life care. Dad’s last days were marked by a peaceful acceptance of his dying process and cherished moments spent with my siblings. My parents’ legacy includes their example of how to live and how to die.